Gary, Indiana, is one of six pilot sites employing strategies, examining policies, and developing evidence through research to reduce implicit bias, enhance procedural justice, and promote racial reconciliation. Gary, Indiana, is one of six pilot sites employing strategies, examining policies, and developing evidence through research to reduce implicit bias, enhance procedural justice, and promote racial reconciliation. The city was selected as a pilot site for its demonstrated willingness and capacity to engage in the National Initiative’s research, intervention, and evaluation process, as well as its jurisdiction size and demographic composition. This status report comes as Gary moves into a fourth year of work with the National Initiative: moving forward, the Gary Police Department (GPD) will take steps to institutionalize each component of the NI to ensure sustainability and longevity. To read the 2018 status report for Gary, please click here. If you would like to read the 2017 report for Gary, you can find it here. A first site visit in April 2015 brought together interested residents and community groups of Gary at Indiana University Northwest Savannah Center to participate in a community convening to discuss the National Initiative project. At this convening, the National Initiative introduced the goals and strategies of the project and explained how community members can participate directly. The National Initiative team also met with city leaders, representatives from the police department, and prosecutors to discuss the role of criminal justice practitioners in this historic initiative. Below are some items that the National Initiative and Gary have produced so far. As part of the National Initiative’s commitment to evaluating the effectiveness of its interventions, the Urban Institute surveyed residents from Gary’s highest-crime neighborhoods regarding their perceptions of and attitudes toward criminal activity and the police department. The surveys were conducted through face-to-face interviews in September 2015. Prior to our first site visit, Mayor Freeman-Wilson sent a letter of support to the National Initiative detailing her administration's full support for the new initiative in Gary. The National Initiative visited Gary in October 2015 to review elements of the implementation plan and continue strategy planning for moving forward with Gary's process. 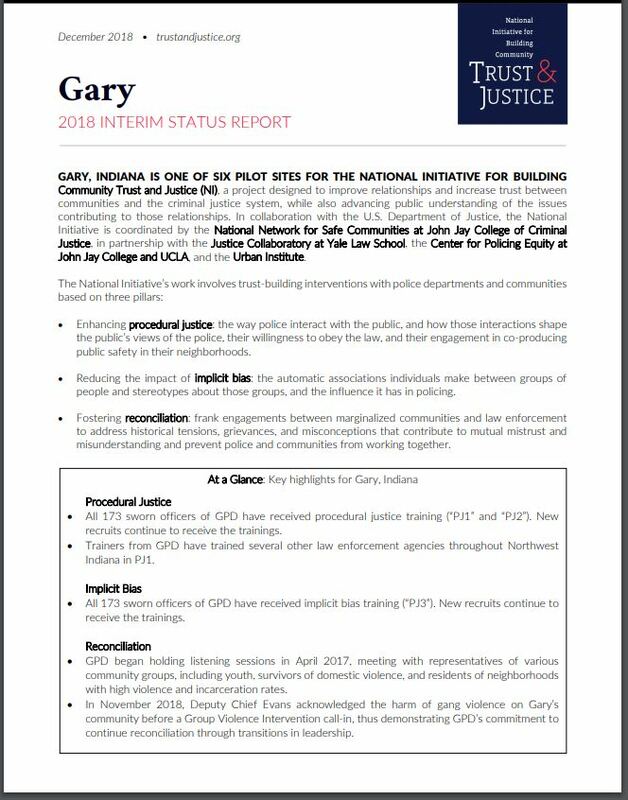 The implementation plan for Gary contains information regarding trainings in procedural justice and implicit bias as well as initial assessments of key stakeholders' attitudes going into the reconciliation process. The document goes into detail regarding unique interventions and what certain of these processes entail. Our first site visit to Gary included meetings with law enforcement and community representatives to begin laying a foundation and charting a course for the work that will be done in Gary in the coming years. Gary is a city in Lake County, Indiana, United States, located in the southeastern portion of the Chicago metropolitan area. Gary is located 25 mi from downtown Chicago, Illinois and 12 mi from Crown Point, Indiana, the county seat of Lake County.